During a lifetime devoted to the sect, trying to Grand Master Le Sang is worthy successors Best of Morning Nguyen Loc in the construction and development of Vovinam-Vietnam Vo Dao. Try Le Sang Masters courses. Domicile in Thanh Hoa Province, Grand Master Sang Le was born in the fall of 1920 (Soup) at home on the banks of Truc Bach Lake (Hanoi). He is the firstborn of Le Van Hien specific Quang Duc (1887-1959) and Nguyen Thi Mui instruments (1887-1993). Two sisters grandmaster Le Thi Export (1927-2004) and Le Thi Hoai Huong Residual Self (born September 12, 1937). In early 1939, he had been sick and had difficulty walking legs. Listen to the advice of his mother, he found he practiced martial arts for the purpose of training for his legs and healthy body. Good fortune steered him to the Vovinam class at the Hanoi Teacher Sang Nguyen Loc by direct teaching in the spring of 1940. There are sports qualities, intelligence and hard to learn and diligent practice, the His health soon improved and rapid progress on the way of martial arts. Just a few years later, he was appointed Founding participants in Hanoi Vovinam training. Since then, he has been attached to the Founder as siblings, co-workers and each followed hardships teaching Vovinam Founding in some areas in the northern provinces of Vietnam: Huu Bang, Che Luu, Am Thuong Thanh Huong, Dan Ha, Phu Yen, etc. In late 1954, he was assigned to teach Founding some Vovinam class in Saigon and Gia Dinh province. By the end of 1957 (Dinh Dau), when ill Founder, Grand Master Sang Le continuing training for all students attending the Founding then; while continuously open 3 dojo in Tran Khanh Du (Tan Dinh), Su Van Hanh Street (near An Quang Pagoda) and the corner of Tran Hung Dao – Huynh Man Dat (also called Moulin Rouge – a discotheque was discontinued operations). In late April 1960, before passing away, Founder Nguyen Loc was tasked to lead back to his sect. In early 1961, due to the martial arts school in Saigon banned should grandmaster Le Sang to teach martial pauses. Some time later, Nguyen Hai (brother of Founder) had difficulty in clearing the rubber plantations and logging in Buon Ma Thuot and Quang Duc should have asked Grand Master Sang Le custodians help him. Until late 1963, when the martial arts were allowed to operate again, he was back, shaking hands with a core team, restore and develop the discipline. Late grandmaster Le Grand Master Sang and the masters of the discipline level. As senior disciple colon, alongside Sang Nguyen Loc in nearly 20 years, Grand Master Le Sang has acquired ideas Budo and martial arts as well as the personality of the Founder’s life the most profound way. By morality, passion and his talent, Grand Master has maintained unity in the discipline; concurrently with the contribution of many generations of masters, coach, students and friends, Grand Master has developed some of the Founder’s idea to build a system for Vovinam martial philosophy and systems engineering scientific practice and practical today. Remember the mid-1960s, though many needy life, but in parallel with the development organization sect, live every day dozens of hours of training; So that night how Grand Master still keep lighting system and writing to develop ideas Budo. It’s thought system user who Vovinam disciples to a good life philosophy: “Live, live and let others live for others.” Accordingly, the Vovinam students not only practice, “to overcome the weakness of soul and body”, organized for themselves a better life, but also not infringe on other people as well as lives have responsibility to help others live well and are willing to sacrifice the interests mental or physical to serve the common interests of the sect, society. 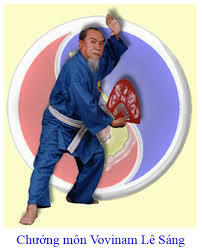 Not only that, the Grand Master also nurtured the technical system of Vietnam Vo Dao Vovinam-date and rich diversity. Even at the age of foreign “antique furniture hybrid cross sacrifice”, Grand Master continues to research, additional technical systems to suit many objects in the new stage – stage Vovinam strong growth abroad after landmark originally founded in France in 1973. The vital contribution of Grand Master Le Sang which is a prerequisite for Vovinam movement grows, sublimated and gradually spread to over 40 countries around the world as a strong affirmation of Communication martial system and the cultural identity of the people of Vietnam. In addition to caring for the sect, Grand Master Le Sang also participated in other activities. He was elected General Secretary of the Right of South Vietnam and the General Treasurer Olympic Committee of South Vietnam many consecutive terms (from the early 1960s to the early 1970s). In the meantime, with a high sense of responsibility, tact and impartiality in the work, he was sporting officials and other masters of loving discipline. Not only good at martial arts, capable leadership and good business, Grand Master Le Sang was a talented man. By the definition of the calligraphy, he often composed many poems full of deep emotion and tinged with chivalry. Some poems of Grand Master (pseudonym Quang Vu, Huy Vu) have been set to music. In real life, live Grand Master cavalier, casual, often help friends and behave cordially with those around you. For the disciples, His hearted teacher, love and tolerance. The time parents fall sick, he was always close and attentive care. Throughout his life, the Grand Master was a modest example, constantly self-taught, self-forged to meet the responsibilities that have been entrusted Founder. Even if they or sect facing hardships, challenges enormous, he retains the personality, persistence, hard work and optimism, belief in a good tomorrow. Almost a year, despite declining health, but Grand Master Le Sang is still lucid and wise. In his final days, though struggling with illness, Grand Master still show high responsibility for the development of the discipline to prepare personnel and leadership responsibilities transferred Vovinam back to Council Managing Masters. Living alone, no family burden, like reading, imbued with Eastern philosophy, and also the best successor of Founder Nguyen Loc; Grand Master Le Sang was sacrificed and devoted his life to the building and development of Vovinam. After a period of critically ill, Grand Master Le Sang has followed Founding eternity at 3 o’clock September 27, 2010, to August 20 Tiger year, at the age of 91 years old. The departure of Attorney is a permanent loss to the martial arts and martial arts background and is not what the big loss to offset all Vovinam disciples all over the world.